Ranked in the Top 100 Golf Courses by Golf Digest Magazine, and as the #1 golf course in San Diego County and #6 golf course in California according to the Zagat Survey. Built in 1999, Maderas Golf Club is recognized as the best high-end golf course in San Diego County. Designed by Johnny Miller and Robert Muir Graves, the par 72 championship golf course features 5 tee boxes, dramatic elevation changes, and winds through riparian streambeds, one hundred year-old oak trees and natural rock outcroppings. The Club also boasts a complete practice facility, including a double-ended practice range with two putting and three chipping greens, plus a fairway bunker and a separate teaching area. Additional amenities include a spectacular 10,000 square foot clubhouse that includes lockers, indoor and outdoor dining opportunities. In 2007, Sunroad completed the Del Lago Ballroom, a 8,500 square foot special event pavilion, offering indoor and outdoor function space with breathtaking views of the golf course and water features. 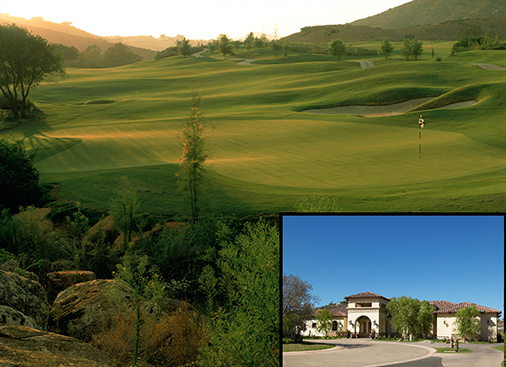 Del Lago is a spectacular site for weddings, parties, business functions, and social events.